The Email with Attachment plugin allows an attachment to be attached to an email that it sent when a list item has been added to a section, such as a contact form, or a subscription form. The EmailWithAttachmentPlugin must be enabled before it can be used. See Enabling Plugins for more information. First, disable the normal email that would be sent from the form. The plugin will replace the default email sending built-in to Pixelsilk, and allow attachments to be added. Next, add a new EmailWithAttachment control to the site. See Creating New Controls. Open the new control in the Controls view. From here you can set the normal email parameters, such as who the email is to be sent to, and who it is from. You can also choose the file that is to be attached to the email using the dropdown. Note that tokens (which come from the form page type) can be used in the "To Address" field. This can be used to send an email to the user who filled out a form. There are two methods to generating the body of the email. 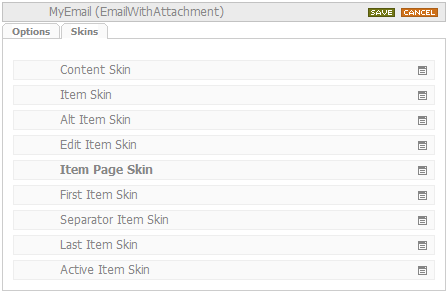 One is to insert the item skin (the Item Page skin) of the page type in the body, the other is to supply a custom email by using the Item Page Skin of the control. If an item page skin is supplied, as well as choosing "Insert Item Page Skin After Body", then the item page skin will appear after the control's body (the control's Item Page Skin). That's it! An email with an attachment will be sent when a new item has been added via this form!